I have to admit that Thanksgiving is one American holiday that we could all benefit from adopting. Not necessarily all the food and the trimmings but rather the underlying idea to make the time to express our thanks for the people, the things, the experiences and the opportunities in our lives. I will admit that I do endeavour to include gratitude and thanks into my daily routines. However in the busyness of the day to day it is quite possible that I forget to communicate that thanks and appreciation to the people that I interact with. 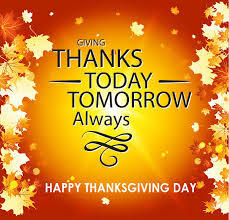 That is why a day dedicated to “thanks giving “ day is a great opportunity to pick up the phone or send a message to all those that I may have not thanked in a while. And so when I later had a very, very, near miss with my car (the other driver reversed onto the road in front of me and my reactions were spot on) I found myself being very grateful for karma. That said it still took a number of hours for the adrenaline/cortisol rush to calm down. I was even more grateful that my daughter who was traveling with me able to experience the stress, be aware of how her body and mind reacted and nothing bad actually happened. – Nothing but learning. So you see, even in the most mundane of days we encounter situations for which we can be grateful. And so my challenge to you this week is all about gratitude. Are there people in your world, to whom you have not expressed your gratitude in a while? Perhaps you can use this all American holiday as the perfect excuse to pick up the phone and make a call.